Personalized Scrolling LED Message Badges with 118 programmable characters. Promotional, Inexpensive. 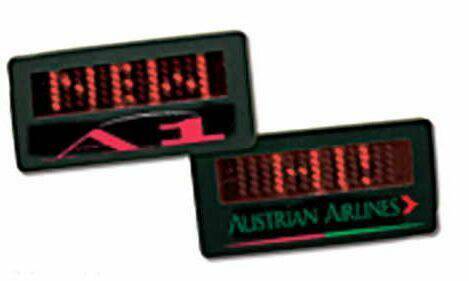 Bulk custom imprinted LED scrolling message badges at bargain prices. Get this great new mini scrolling badge with your custom message. You can use up to 118 characters and 65 Red LED's with close to 100 hours of use. An excellent attention getter. We also supply blank (not imprinted) scrolling message badge Free artwork design. We will send you a proof for your approval before production. Budget Prices in USA and Canada for wholesale scrolling message badges. American clients pay no taxes. Production Time 10 Business Days after art approval. The unit prices below include your 1 color custom imprint. Call us to place an order or fill up the Order Form below. Our artwork design is free. Please Email your imprint to info@mapleleafpromotions.com and we will Email you a proof for your approval before production. We will add the most economical shipping charge by UPS Ground unless you instruct us differently. Thank you!